The countdown is over! The Prince Caspian movie opens in theaters today. Here is a roundup of links to all the Countdown to Caspian posts. Each post contains a favorite passage from the book, Prince Caspian, along with thoughts and reflections for application. I hope you enjoyed the series. And I hope you enjoy the movie. Now, somebody please pass the popcorn! 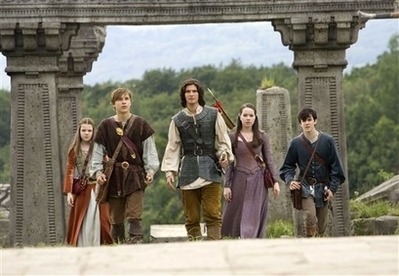 The Chronicles of Narnia: Prince Caspian opens in theaters on Friday, May 16. In order to whet your appetite, I am counting down the fifteen days to the movie by sharing a favorite selection from each of the fifteen chapters of C. S. Lewis’ masterful book, Prince Caspian. (Warning: Plot spoilers ahead! But if you haven’t read the book, you should really read it before going to see the movie anyways!) Here goes — let’s count down to Caspian! “Please, your Majesty,” said the Bear. “Why, you’re doing it this minute!” bellowed Trumpkin. The Bear whipped its paw out of its mouth and pretended it hadn’t heard. “I must confess — I cannot deny it — that I am deeply disappointed in the result of the operation,” came the answer [from Doctor Cornelius]. “And now!” said Aslan in a much louder voice with just a hint of a roar in it, while his tail lashed his flanks. “And now, where is this little Dwarf, this famous swordsman and archer, who doesn’t believe in lions? Come here, Son of Earth, come HERE!” and the last word was no longer the hint of a roar but almost the real thing. “Wraiths and wreckage,” gasped Trumpkin in the ghost of a voice. She never stopped to think whether he was a friendly lion or not. She rushed to him. She felt her heart would burst if she lost a moment. And the next thing she knew was that she was kissing him and putting her arms as far around his neck as she could and burying her face in the beautiful rich silkiness of his mane. “Look! Look! Look! cried Lucy. “Do you really mean — ” began Peter. “Where did you think you saw him? asked Susan. “If your Majesty is ever to use the Horn,” said Trufflehunter, “I think the time has now come.” Caspian had of course told them of this treasure several days ago. “I agree with that,” said Master Cornelius. “And what do you think, Trumpkin?” asked Caspian. “Then in the name of Aslan we will wind Queen Susan’s Horn,” said Caspian. “Do you believe in Aslan?” said Caspian to Nikabrik. “Shall I never see you again?” said Caspian in a quavering voice. He put in Caspian’s hands something which he could hardly see but which he knew by the feel to be a horn.